We leave Montreuill-Belay which is about 25 minutes south of Saumur in the Loire and head to Sarlat in the Dordogne. I really like the camp site we have just left and will defo keep it on my itinerary for future trips to the south. Yesterday, at home in Liverpool – real time, I was looking at a route to the south of Spain for some winter sun. Hmmm – not sure if I’m ready to join that gang yet. Not that I know ‘that gang’ but Malaga in January isn’t exactly the lotus-eaters is it? Younger readers may want to Google ‘The Lotus Eaters’, a TV series from 1972 set in Crete. The drama focused on a group of ex pats living on the island of Crete and living their life as ‘lotus eaters’. According to Greek mythology those who ate the fruit of the Lotus tree lost the desire to return home. They were basically living a pretty chilled life! I’m not sure I am a lotus eater, I think I quite like returning home. However, my memories of the series are that in a grey, 1970s Preston, I found the programme beguiling. The ‘Telegraph’ describe the Dvd (sold out) as ‘tantalisingly watchable’. I feel I have to add something of an editorial warning here to my love of the programme, I also quite liked ‘Elderado’ the Spanish-based soap opera which went our nightly on BBC1 in the 90s, but I certainly wasn’t beguiled by it. The haunting theme tune of ‘The Lotus Eaters’ trailing from the windows of our terraced house on a Sunday night in Preston took me far away from Lancashire and probably also far away from doing some homework! Perhaps I’ve always come to things late in life, but in four weeks time, I plan to visit my first ever Greek island – Santorini. I’ll let you know. First, I have this to write and a little trip to Naples to fit in. 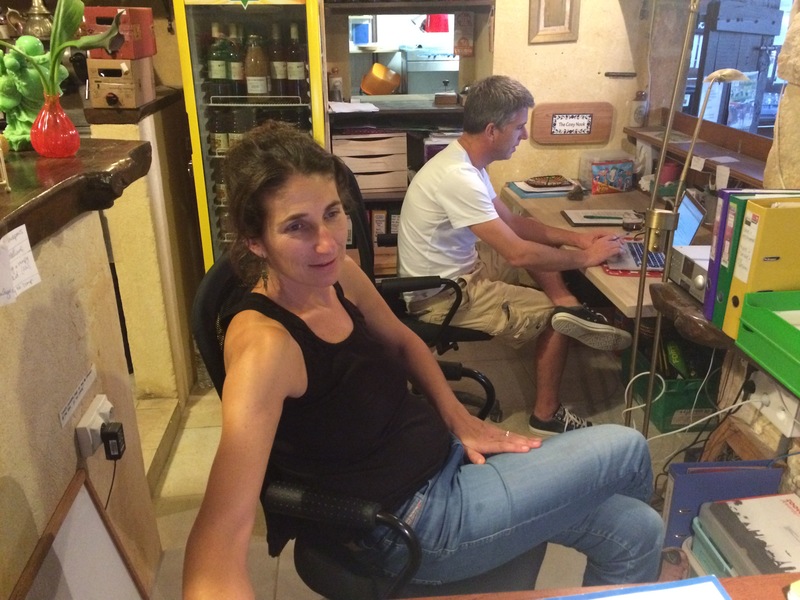 Back to the plot – me, Margaret and ‘Phoebe’ heading south into increasing sunshine and warming temperatures. 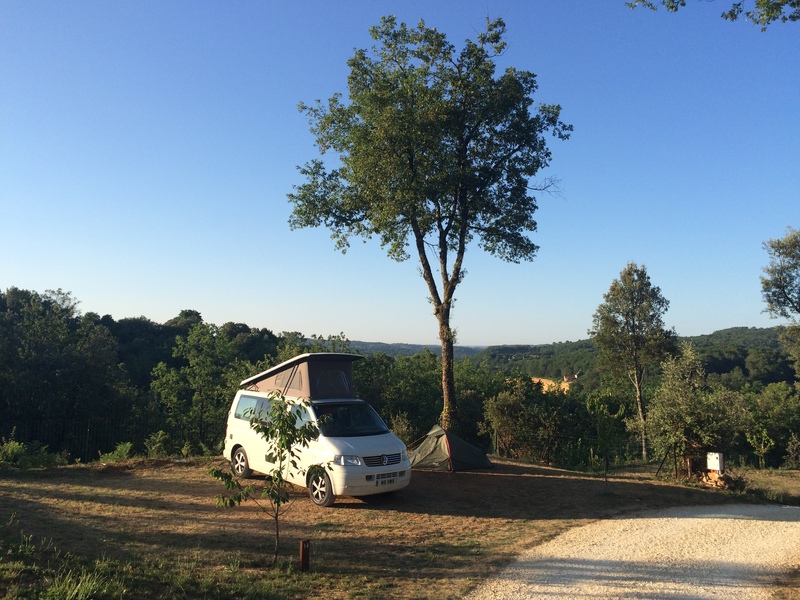 We’re heading to the excellent Les Mathevies camp site at Sainte-Nathalène which is about 20 minutes from Sarlat in the Dordogne but more of that later. 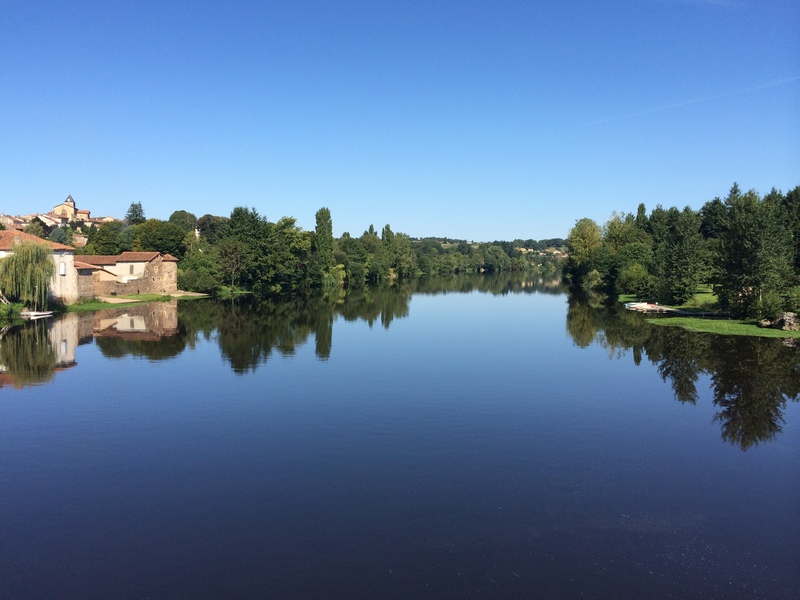 The route down to the Dordogne is beautiful and just gets better and better as you go. 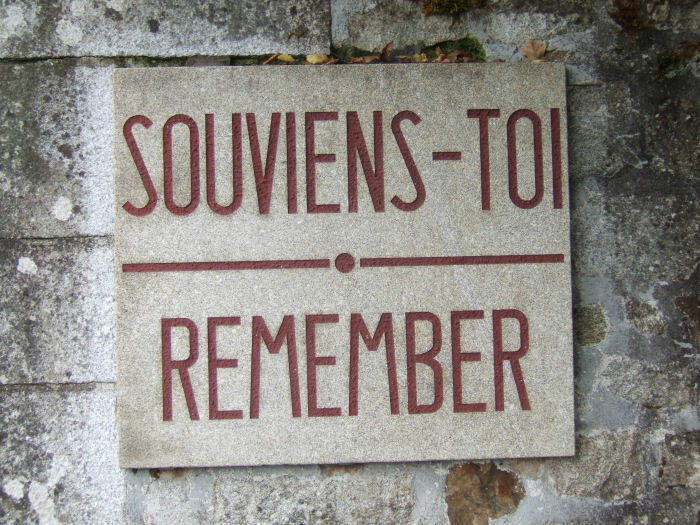 Although Ste-Nathalene was our final destination that day, first we were making a stop at Oradour-sur-Glane, the scene of a Nazi atrocity from June 1944 and today perhaps France’s most significant national memorial. One great thing about working in a school is your have on tap a ready source of knowledge. Computer issues see the IT dept; find out what the favourite books are of seriously well read, processionals, ask an English teacher; want to know someone’s favourite number, ask a Maths teacher. Ho, ho. Sorry. But a member of the History dept, Matthew, told me a few years ago that he and his girlfriend had visited this place near Limoges called Oradour-sur- Glane. His description of it and the impact it had had on him, was such that I resolved to definitely visit it one day. I have now been three times. On the way to Oradour-sur-Glane, we stopped for coffee in the lovely village/commune of Availles-Limouzine. On Saturday, June 10th 1944, six hundred and forty two men, women and children were slaughtered by SS Stormtroopers who were heading North to engage with Allied forces, this being 4 days after D Day. 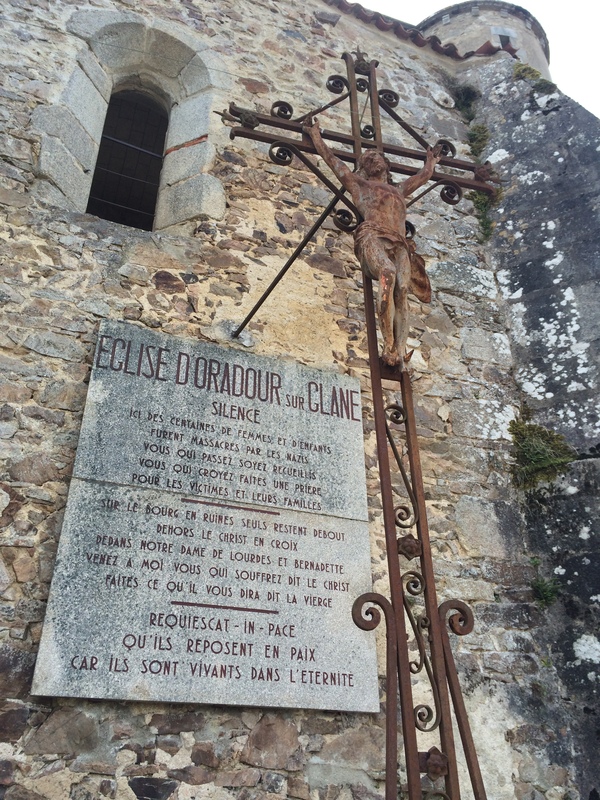 This mass murder was inflicted on especially innocent people – there having been no history of resistance by the Maquis (the French Resistance fighters) in Oradour-sur-Glane. There had been resistance in neighbouring areas but they were left alone thus heightening the terror of the mass killing in Oradour. It goes without saying that this is one place perhaps we should visit, and the message ‘Souviens-Toi. Remember’ is as relevant today as ever. The church where the women and children were murdered although two escaped and so we today know the story of what took place there. The village has been left as it was found the day after the massacre. 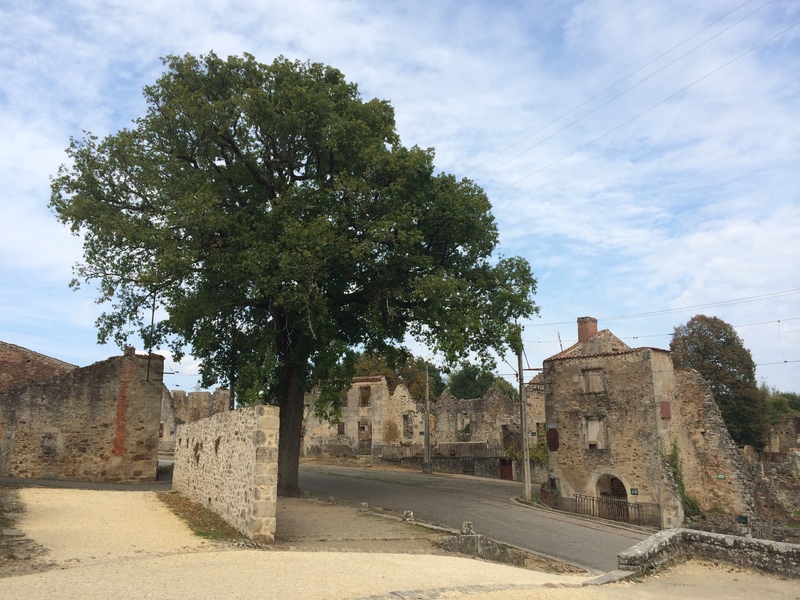 What always strikes me when I have visited Oradour is that these magnificent, beautiful trees were there on that day. On my visit last year, the trees were shedding their leaves like tears. Those beautiful trees: a silent witness to the horrors of the day. As visitors you are asked to keep silence. It is a request that is entirely appropriate and held by all. After a four hour visit, we move on and arrive at our resting place for the next two days: Camping Domaine de Mathevies at Sainte-Nathalène. This magnificent place I discovered last year while ‘wandering about’ a bit on my own and I would highly recommend it to all. and by some stroke of luck/my inability to remember which pitches the co-owner Natalie said I could NOT have, we ended up being allowed to stay on the same pitch as the front cover above. Thank you Natalie and Patrick. It was Patrick who said we could. I suspect he was doing his bit for ‘Care in the Community’ looking after we mature travellers. So there we are, settled on an excellent campsite with a magnificent view to wake up to. Unashamedly I love my VW campervan. There is a definite pecking order of VW vans which I won’t go into here mainly because I’d need a handbook to really remember all the different models. I just love my van and the freedom it gives. However, VW owners do sometimes acknowledge each other and then model can become a factor in the interaction. About 50 yards from us at Les Mathevies, was a campervan, more or less the same as mine, but older. Mine’s a T5, my neighbour’s was a California. Californias are the real deal whereas mine is a bit of a hybrid – a conversion from a ‘proper’ van whereas the California left the German production line as a campervan. Californias have pedigree. However, mine is rather good looking and much younger than my neighbours, hence perhaps some sort of equality of respect was established between we two owners. I do want one recurring theme to be returned to in my blog and that is an acknowledgement of ‘social norms’. Social norms are a defining and identifying feature of any culture and culture is fun! Okay – me and the California driver are English. We make no contact in the first 24 hours. While I certainly was not monitoring the movements of the California owner in any shape or form, I was aware of him passing, sometimes at impressive speed on his early morning runs. I mean there are hills here and the temperatures were always either in the 30s or heading that way. I don’t know who cracked first; me or California man. But with a certain English reserve we made contact. We connected. We came out. We had a campervan compatibility that cannot be denied. ‘Hi’. It was me who cracked first. Forget the minutiae of the conversation. The guy was a delightful young man, an IT/software consultant sort of thing. They live in the South East and have travelled widely in their van. Loads of places. Scandinavia; Holland; Spain; proper stuff and now they have a little baby and they were having their first trial trip in the van with a baby. 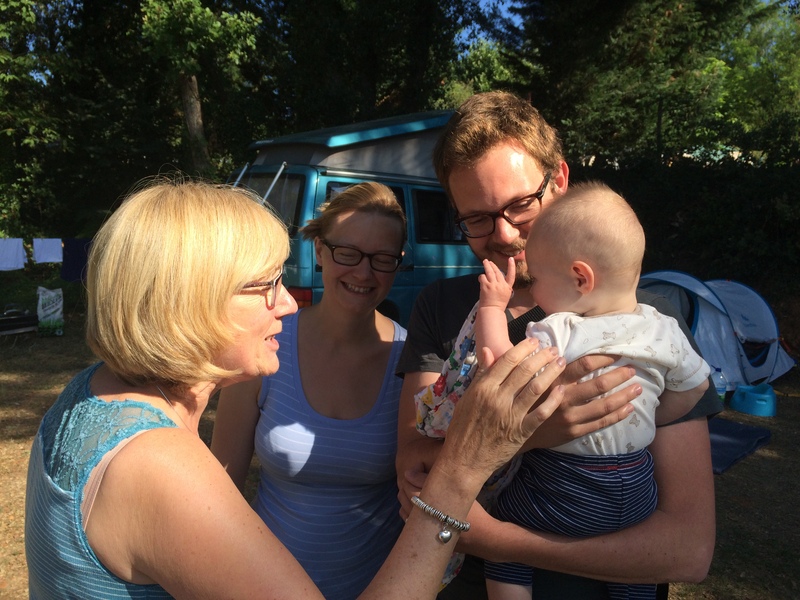 The searing heat of this summer in France was difficult for the baby – Freddy – but all was going well. ‘Err, does your van have a name? ‘Of course’, Mr California man replied, ‘It’s Birgit’. He explained they had wanted a sturdy, German, reliable kind of name. However, Mr California’s van had in fact fused the entire camp site a couple of times before our arrival, so perhaps Birgit was being a little too sturdy and not quite reliable enough except for a certain consistency in blowing fuses. I explained that I had gone for the more esoteric ‘Phoebe’ – a name I remember fondly from my childhood being used for ‘sun’ by my farming family. Blimey – another connection – Greece comes to the Peak District ( where my relatives still farm). Mr California went on to defend the principle of naming your van and proudly announced that ‘Sally sat Nav’ approved as well. Trust me – it was a good, genuine laugh. Two grown men – me more grown than he – acknowledging that we were having a conversation that would take a certain confidence to have. Basically, there is fun to be had in having a campervan. That may sound too obvious to be true. 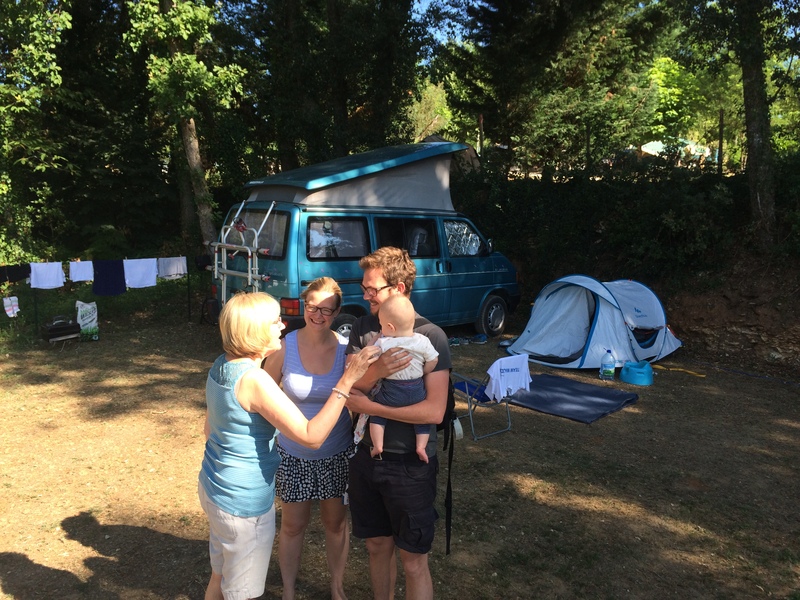 Anyway – that was the end of the interaction with our near neighbours save that on the day we left we went to say goodbye and quite rightly it was left to Freddy to cement the brief camp site friendship and make chatting easy. Babies are great but I hope I’m man enough to admit that I was as interested in Birgit as I was in Freddy. I went to say my goodbyes to Patrick and Natalie who are lovely, friendly, funny (amusing) people who own and run this great campsite. 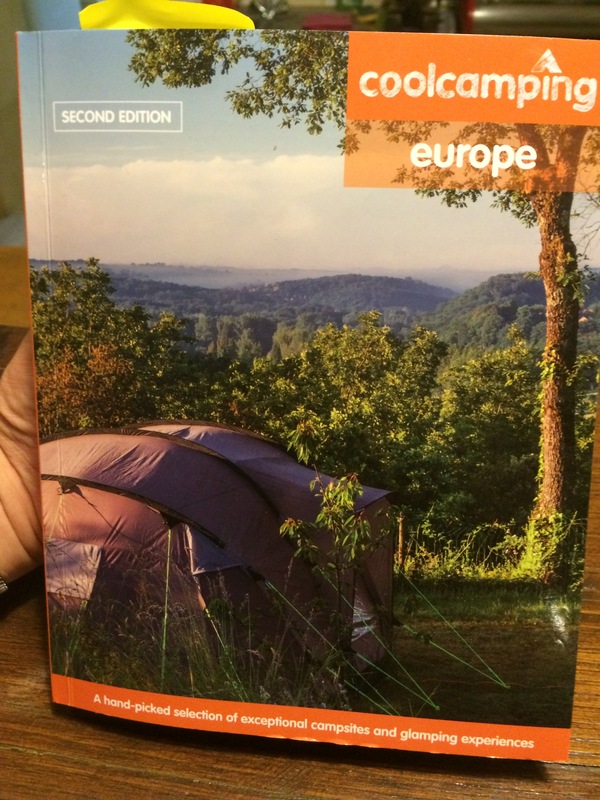 I mean, if it’s on the front cover of Cool Camping Europe, you know it’s going to be okay! Apart from being a great site for location, facilities, surrounding beauty, fabulous local craft beers etc etc, Patrick and Natalie bring an understated warmth to the experience of staying with them and their family. I hope to see you next year. I’m with you 100% Keith eg I Love San Sebastian but I was thinking of winter sun?